"Argh! I made it from me father's scalp!" People will stop you in the street to get a closer look at the "compass rose", pirate ship, and other fine details covering this work of art! 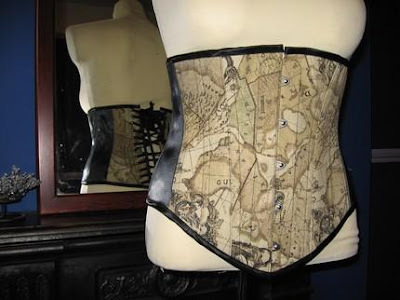 Corset details include: "Continental Shelf", "Warning! There be Savages Here", "Lacing Straights", and "Sea of Virtue". Courtesy of The Map Room.